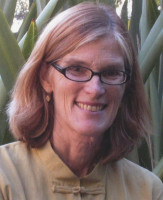 Kristine Samuelson has been an independent filmmaker for over 25 years. She was nominated for an Academy Award for Arthur and Lillie and has received Artist’s Fellowships from the National Endowment for the Arts and the California Arts Council. A faculty member in the Documentary Film and Video M.F.A. Program at Stanford University, she is the Edward Clark Crossett Emerita Professor of Humanistic Studies in the Department of Art and Art History. From 1999-2006, Samuelson served on the Board of the Independent Television Service. She is a member of the Academy of Motion Picture Arts and Sciences. The honor validated my artistic practice and supported my film. It was a strong message to me that I was on the right path. I would encourage finding a group of fellow travelers with whom you can discuss issues and ideas about your art and art practice. This support is so valuable over the years.